Thank goodness we have a wooden fence rather than chain link. 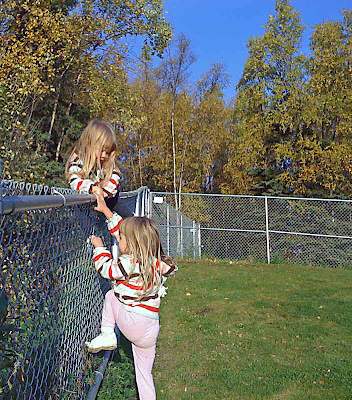 I can only imagine what will happen if my daughters ever try to climb our fence. Ack! Ouch. I feel your pain. I used to play nanny to twin 3-year-old boys. I feel a tiny bit of your pain! OMGoodness, they are quick little buggers, aren't they? Quick, Mom's vacuuming...let's make our getaway now! Hey, we had minestrone soup and corn bread tonight for dinner, too!! Soup and corn muffins sounds so good. u certainly have adventurous children! So, I showed this picture to Brett, and he says, "They're like 5, right?" I said -- NO ... this will be us in about 18 months. I have to keep the chairs turned over, in the floor, to keep them from climbing the table. Sigh .... do you have grey hair like me?? Word Verification: sorests .... like when the children are gone, mom can finally have her sorests. Hilarious! I can totally see this in my future! ha ha! those crazy twins. you need a higher fence, for sure.